Coal ash more radioactive than nuclear waste! It’s a morbid topic, but there is even a scale called the “Death’s per Terrawatt” scale. It takes an equivalent measure of energy, the terrawatt, and measures how many people die as a result of that energy. Coal is a Chernobyl every week! The Energy Collective shows that tobacco kills 5 million people a year, but nuclear power has probably only killed about 4000 people in its entire history! Existing nuclear power has already saved 1.8 million lives in America. How many lives would have been saved if we had switched from coal to nuclear power by 1970? I roughly halved the death rate till the 2000’s to account for world population growth and world coal use across the 1970 to 2000 period, and then added the ‘normal’ 2.6million deaths per year from 2000 onwards. By the end of 2015, my very rough, back-of-the-envelope guess is that we could have saved 78 million lives, or more people than were killed in World War 2! 2. Coal ash more radioactive than nuclear waste! The death toll from all this radiation must be catastrophic! Right? Well, no. Coal smoke is deadly, and the particulates kill millions a year worldwide. But the radiation? Not so much! It’s just one of those things we over-hype all the time! “McBride and his co-authors estimated that individuals living near coal-fired installations are exposed to a maximum of 1.9 millirems of fly ash radiation yearly. To put these numbers in perspective, the average person encounters 360 millirems of annual “background radiation” from natural and man-made sources, including substances in Earth’s crust, cosmic rays, residue from nuclear tests and smoke detectors. Is coal cheap? Not so much if you should double the electricity price to include the health costs! Who pays this cost? You can be sure it’s not the Koch brothers! (American coal barons). “Although it is difficult to assign a cost to these numbers, estimates have suggested a 10% increase in health care costs in countries where coal makes up a significant fraction of the energy mix, like the U.S. and Europe (NAS 2010; Cohen et al., 2005; Pope et al., 2002). These additional health costs begin to rival the total energy costs on an annual basis for the U.S. given that health care costs top $2.6 trillion, and electricity costs only exceed about $400 billion. Another way to describe this human health energy fee is that it costs about 2,000 lives per year to keep the lights on in Beijing but only about 200 lives to keep them on in New York. Harvard University: Coal health impacts cost America at least $300 billion every year (possibly more), the same as another war in Iraq every 6 years! What kind of person claims coal is ‘cheap’!? Beijing is closing its last major coal power station next year in an attempt to tackle air pollution which is costing the economy more than 10% of its GDP. Bloomberg reported that the state-owned, 845-megawatt power plant will close in 2016. Last week, another two coal-fired power stations were closed down in the Chinese capital, adding to the first plant closure in 2014. The facilities will be replaced by gas-powered plants, which produce less harmful emissions and can supply 2.6 times more electricity. In September, a report by the Global Commission on the Economy and Climate found that air pollution caused by the most dangerous kind of particulate matter – known as PM 2.5 – was linked to around 1.23 million premature deaths in China in 2010, costing around 13% of GDP in lost economic activity. “The health burden of coal in Australia due to air pollution was estimated by the Australian Academy of Technological Sciences and Engineering to be $2.6 billion per annum (or $13 per megawatt hour)”….. The NSW Department of Environment and Conservation The total health costs of annual emissions of common ambient air pollutants from all sources in the GMR from 2000 to 2002 were conservatively estimated to be between $1 billion and $8.4 billion per annum. This is equivalent to between 0.4 per cent and 3.4 per cent of gross state product. environment.nsw.gov.au/resources/air/airpollution05623.pdf  This cost cannot be apportioned between electricity generation & other industrial pollution and vehicular pollution but an assumption of half and half distribution would be reasonable. According to UNESCAR, Chernobyl only killed 64 at the time, but it has been calculated that the extra radiation will eventually kill about 4000 people due to the longer term effects of radiation. This may be overly pessimistic because of the assumption that there is no safe level of radiation. See 2: “Linear No Threshold” on my Chernobyl page. That graphic says “per watts produced” but watts are energy/time, not energy. It should be in watt-hours or joules. both terms have their place, so it depends what the original author was saying. Technically it should probably be in Gigawatt hours or Terrawatt hours, but that graphic is from Next Big Future which referenced it from another original article, and so I can’t see the original context. It probably did the layperson thing of explaining it in how many outputs of power (instead of energy units sold) over a year. 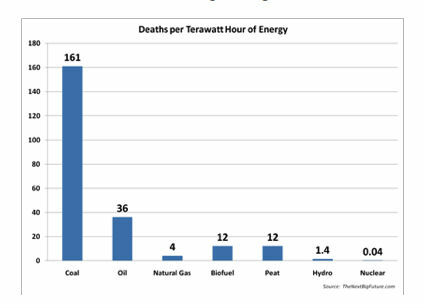 EG: If x terrawatts of nukes and y terrawatts of coal burn for a year, these are the deaths. Power by time *should* probably be expressed as energy, but again, it depends on how they were presenting it to their audience. 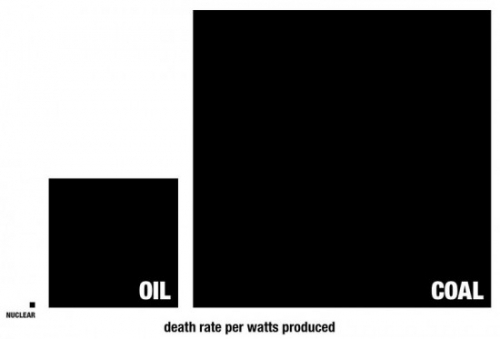 No, “deaths per watt” just doesn’t make any sense. If you produce 1 watt of energy for 1 year, or 1 watt of energy for 1 billion years, would the deaths be the same in both cases? Obviously not, The second case would have 1 billion times as many deaths, even though the wattage is the same in both cases. It’s total energy that matters, not wattage. I’d like to know realistic numbers for this. electricity generation doesn’t include gasoline for cars and diesel for trucks though.